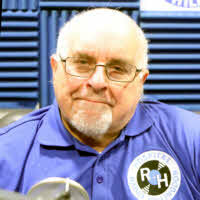 I first came down to Radio Hillingdon in 1979 when a girl I was very friendly with at the time metioned she was a member. I thought it interesting and visited the station one evening and I was hooked. Sadly the friendship with the young lady went cold but my love affair with Radio Hillingdon never has. I have been a member ever since and done lots of programmes of all types. Currently I'm doing Thursday's Early Evening Show 7 till 8.30 with Michelle Denman and 12 till 2 on Saturdays. I also stand in for other presenters when they are unable to do their shows. I have also been on the Committee for a large part of that time. I was Committee Secretary for 16 years. Apart from that I am involved with Fund-Raising activities (otherwise I would be hassled by our Fund Raising Manager Sheila Frederick) and I am at present the Librarian looking after our record library which after so many years is very extensive with music on all types of formats. In real life I work for WH Smith as a Book Specialist in their Gerrards Cross branch. I have worked most of my career in the book trade with various companies. My other spare time activities are Geneology I'm a member of the local history society, reading, music, movies and the Internet also on the Residents Committee of my block of flats and I am on the Parochial Church Council of St Mary's Church Hayes.